This stylish five-star luxury resort hotel stands in a privileged location on the west bank of the Mae Ping River close to the Old City of Chiang Mai and 15 minutes from the airport. The Chedi´s original, open-plan Thai architecture incorporates a split-level wooden colonial building, once the British Consulate, now the main restaurant. 52 guest rooms and 32 suites with garden and river views bear the Chedi hallmark of privacy, modern comfort, reliable facilities and excellent service. Porter 24 hrs. Travel desk, car-hire desk, flower ordering service. International newspapers available. Hotel gift shop offering wide selection of Asian arts and handicrafts and selection of items created exclusively for the Chedi; open 08:00-22:00. WiFi internet connection available throughout hotel. Evening turn-down service. Laundry, pressing and dry-cleaning service. Iron and ironing-board available on request. Babysitting on request. Medical service on call 24 hrs. Complimentary room upgrade at check-in subject to availability; VIP treatment, welcome drink at check-in; complimentary drinking water per guest per night; late check-out subject to availability; free parking. SPECIAL RATE FOR MINIMUM 3-NIGHT STAY. Deluxe Room Special: breakfast included. Club Suite Special: breakfast and airport transfer included. The Chedi Chiang Mai has 52 Deluxe Rooms and 32 Chedi Club Suites with private balconies. The rooms occupy an L-shaped guest block surrounding a large landscaped courtyard facing the river, and are accessed from exterior corridors and private courtyards. All rooms are open-plan with a screened-off bathroom area; they have teak and terrazzo flooring and are decorated in muted tones in contemporary Asian style; paper and metal light fittings reflect traditional lighting in northern Thailand. All rooms have individually-controlled A/C, blackout roller blinds, LCD flat screen satellite TV, WiFi and broadband internet access, PC and fax connection points, direct-dial telephone, alarm clock, safety-deposit box; minibar and coffee- and tea-making facilities. The bathrooms have separate bath tub and rain shower room, complimentary toiletries, slippers, dressing-gown and hairdryer for client´s use during stay. Non-smoking rooms available; rooms available for guests with limited mobility. Prices quoted below are inclusive of taxes and hotel service charge. DELUXE ROOM: 36 m2 with 14 m2 balcony; king-size bed or twin beds. Private balcony with daybed. Max no. of guests, 2 adults with 1 child on existing bed or third adult on the sofabed. CHEDI CLUB SUITE: 73 m2 with 27 m2 balcony. The one-bedroom Chedi Club Suites are twice the size of the Deluxe Rooms, and have large sitting areas for relaxing and indoor dining, as well as open balconies with comfortable daybeds, outside dining area, and views of the mountains and the Mae Ping River. Chedi Club accommodation includes Bose CD/DVD sound system, complimentary minibar with selection of drinks and snacks, espresso machine and tea-making facilities; 7 articles of complimentary laundry daily and airport transfers by private limousine. Chedi Club Suite guests may use the facilities of the Chedi Club Lounge with complimentary breakfast buffet, non-alcoholic drinks during the daytime, evening cocktails and snacks, butler service. Max no. of guests 2 adults with 2 children, or 2 adults with third adult on the sofabed. Check-in: 14:00; check-out: 12:00 midday. American Express, Visa, MasterCard, Diners Club, JCB. 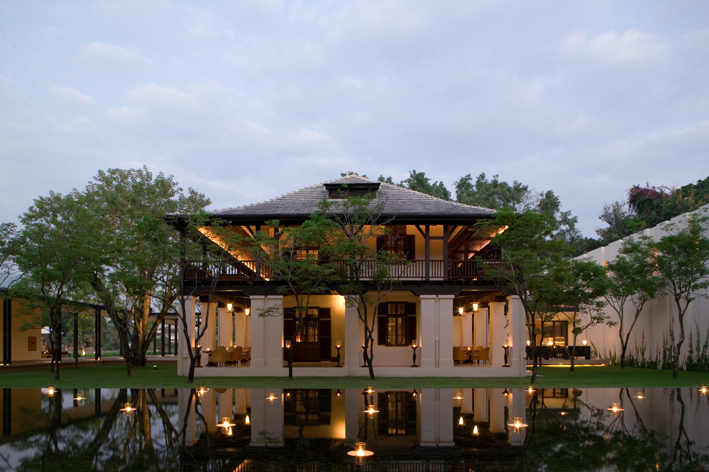 The Chedi Chiang Mai Hotel provides foreign exchange facilities. THE RESTAURANT: Split level wooden colonial building built in 1913 which once housed the British Consulate, now cleverly incorporated into the design of the Chedi Chiang Mai. The restaurant seats 236 indoors and outdoors, with a further choice of air-conditioned indoor dining areas in traditional or contemporary style. Open kitchen in the contemporary dining area; VIP private dining rooms for special occasions. Thai, Pacific Rim and creative Asian cuisine; extensive winelist; vegetarian and diabetic options and children´s menu available; kosher and halal meals on request. Breakfast served 07:00-11:30; lunch 12:00-14:30; afternoon tea 15:00-18:00; dinner 18:00-22:30. TERRACE BAR AND CIGAR LOUNGE: On the second floor of the Restaurant with panoramic views of the Mae Ping river, the Terrace Bar and Lounge has a relaxed atmosphere and casual daybed seating for 70. Wines, cocktails and beverages served. Cigar menu. Ideal for before- and after-dinner get-togethers. Open 17:00 to 01:00. THE BAR: Semi-private terrace with seating for 37 on the ground floor of The Restaurant´s original colonial building. Wines, cocktails and beverages served 17:00 to 01:00. THE LOBBY LOUNGE: The Lobby Lounge has a fireplace on one side and is open to the street on the other. For light snacks, afternoon tea and watching the world go by. Open 08:00-01:00. THE CHEDI CLUB LOUNGE: Exclusive to Suite guests, this private lounge serves complimentary daily continental breakfast, cocktails and canap�s. The venue doubles up as a VIP area for check-in formalities. MEETING FACILITIES: 2 dedicated meeting rooms with state-of-the-art conference and business facilities. Boardroom 17 m2 with rectangular table, max 12 persons. Meeting room 55 m2 for max 49 persons theatre setup, min 30 open boardroom. Floor-to-ceiling window access onto an open air terrace; direct access to The Restaurant semi-private dining rooms via The Terrace Bar & Cigar Lounge. Facilities include WiFi/broadband internet access, video conferencing, independent telephone lines, AV screen, LCD projector, overhead projector, TV, CD and DVD player, whiteboard, flip chart. POOL: Very tranquil, relaxing area for the use of in-house guests overlooking the Mae Ping River. Comfortable loungers with huge towels. Attentive pool staff bring regular top-ups of cool scented face-towels, cold water and poolside snacks. Open 07:00-19:00. HEALTH CLUB: Area flooded with natural daylight on the second floor of the hotel overlooking the Mae Ping River. Wide choice of equipment from resistance training to cardiovascular and free weights; separate aerobic room. Open 07:00-22:00. Tranquil spa near the pool in a setting of scented gardens, water features and quiet interiors. Spa facilities include ten private, contemporary Asian style spa suites, complete with steam showers and terrazzo bathtubs. Deluxe double spa suites equipped with herbal steam rooms, aromatic sauna and terrazzo bathtubs. Manicure and pedicure area offers full range of beauty treatments. Extensive spa menu includes healing massage treatments, body scrubs, wraps, herbal baths, facials and waxing. Wide selection of own-brand spa and beauty products on sale. Open 10:00-21:00. Centrally located on the banks of the Mae Ping River in the center of Chiang Mai City, the Chedi Chiang Mai is within walking distance of the famous night market. Car rental available, with or without chauffeur. Free parking. Transfers to Chiang Mai International Airport by private limousine or shuttle bus. Taxi from airport about 110 baht. Chiang Mai International Airport, 6 km/15 mins. 28 flights daily from Bangkok, flight time 70 min. International connections with other capitals in the region. Chiang Mai Railway Station, 2.3 km/5 mins. 14 trains arrive daily from Bangkok; the trip takes 12-15 hours; most trains provide first and second-class service with sleeping facilities.